State Sen. Jerry Hill, D-San Mateo, addresses reporters after announcing California will pay for a public easement through Martins Beach and the purchase of a new county park along the San Mateo County coastline. The newly created Tunitas Creek Beach can be seen in the background. From left: Hilary Walecka, Coastal Conservancy; Assemblyman Marc Berman, D-Palo Alto; Marti Tedesco, Peninsula Open Space Trust; Assemblyman Kevin Mullin, D-San Mateo; and Hill. HALF MOON BAY, Calif. (CN) – California lawmakers unveiled their strategy for the next round in the long-running feud between the state and a Silicon Valley billionaire over public access to one of the state’s most picturesque beaches. 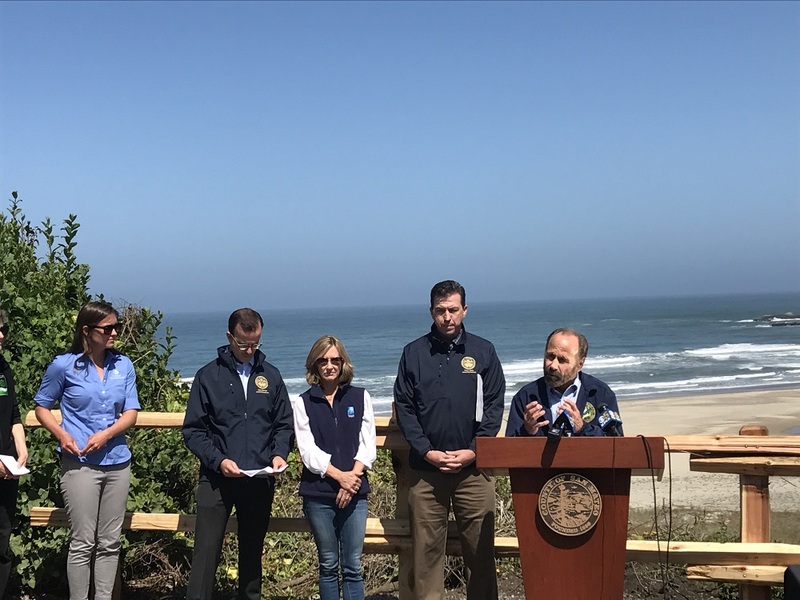 An assemblage of California legislators gathered on the San Mateo County Coast about 50 miles south of San Francisco Friday to announce the creation of a fund to provide money for the purchase of an easement to facilitate public access to Martins Beach. The “billionaire” is Vinod Khosla, who purchased the 89-acre Martins Beach property dotted with cabins seven miles south of Half Moon Bay. 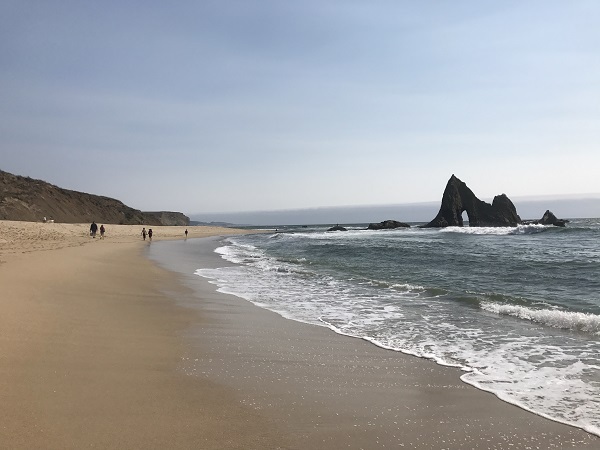 Like all of California’s coastal beaches, Martins Beach remains public – but to access it, the public must traverse a quarter-mile road through Khosla’s property. The previous ownership group, which sold the property to Khosla in 2008, frequently left the gate open so visitors could access the beach — but Khosla didn’t. The closed gate and no trespassing signs drew condemnation from locals and lawsuits from the Surfrider Foundation. Khosla’s lawyers have long argued both in and out of court that the issue comes down to private property rights and that he has the discretion to limit members of the public from walking on his property, while opening and closing the contested gate as he sees fit. The billionaire co-founder of Sun Microsystems offered to sell an easement to the state for $30 million, which is only $2.5 million less than he paid for the entire property in 2008. The state balked. Hill noted the State Lands Commission had the easement appraised recently, and an independent analysis valued it at $360,000, although Hill said the estimate was likely far below any potential purchase price. During the most recent state budget process, state lawmakers — including Hill and Assemblymember Marc Berman, who represents parts of the San Mateo County coast —secured $1 million to be set aside in a sub-account in the State Lands Commission budget with the intent to exercise eminent domain on the easement. “It’s up to the State Lands Commission to act,” said Jennifer Savage of Surfrider Foundation. Along with the state’s $1 million, the county of San Mateo has also agreed to put up $1 million to secure the easement. Hill said that with $2 million available, securing a permanent easement for public access through eminent domain is feasible. While Hill and other officials waxed optimistic, they also expressed worry that Kholsa’s well-funded attempt to get the issue in front of the U.S. Supreme Court could work. “I am so worried that the Supreme Court is going to take on this issue and we are going to lose,” Hill said in an interview after the press conference. Khosla has appealed each of the decisions that have ruled in favor of public access at the California state court level. Last year, he lost in the California state appeals court and petitioned the California Supreme Court to take up the case. The highest court in California declined, at which point Khosla appealed to the U.S. Supreme Court. The Supreme Court has yet to determine whether it will hear the case. However, it has asked Surfrider Foundation attorneys to respond to Khosla’s petition, which indicates it is at least entertaining the possibility. Savage, Hill and other public access proponents worry the current conservative composition of the country’s high court will favor the private property argument and potentially gut the California law enshrining the coast as a public resource. “It’s an attack on the core values of the Coastal Act itself,” Savage said. Meanwhile, state officials are poised to move ahead with eminent domain proceedings, even as they also turn their attention to other public access issues. Hill and California Assembly Members Marc Berman and Kevin Mullin announced the state’s allocation of $5 million to facilitate the purchase of a 58-acre beachfront property only a mile down the road from Martins Beach. “Public access to beaches has always been a way of California life,” Mullin said. The Tunitas Creek Beach, similar to Martins Beach, is a public resource with access problems due to private property interceding between the beach and Highway 1 to the east. But now the state has plans to buy the property and install a parking lot, emergency access infrastructure, a path to the beach and other amenities while creating the Tunitas Creek Beach County Park, to be managed by San Mateo County. The park is slated to open to the public within three years. The California Coastal Commission has also ramped up aggressive enforcement of public beach access, fining property owners millions of dollars for the creation and maintenance of various structures aimed at impeding public access. Whether the commission will have the authority to continue to do so will ride on what the U.S. Supreme Court decides.